Biography of our Namesake: Robert Kirkwood was the most distinquished of the captains in the Delaware Continentals. He was with the regiment from the first battle (Long Island NY in August 1776) to its last battle in the South (Eutaw Springs SC in Sept 1781), participating in 32 battles. He died on the battlefield in Ohio during a failed expedition to quell an Indian uprising. More detailed information (below). History of the Chapter: Kirkwood's founding president Norman Thompson, transferred into Delaware from Newtown Battle Chapter ESSSAR and was named DESSAR membership chairman in 1993. He had been chapter vice president in New York, so he was well-prepared to recruit members, inspire officers, and organize a strong schedule of activities. In January of 1994 he proposed forming a chapter, he held an organizational meeting in March, and he presided over the first meeting of the Kirkwod Chapter in May. The chapter was formally instituted and received its charter from the state society on September 10, 1994. The membership has grown from 31 charter members to about sixty today. Contributions from the Delaware Society and MBNA (now merged into Bank of America) gave us a firm financial foundation that enabled us to make more awards to honor community leadership and to buy some equipment for our color guard. Sometimes we have joint meetings with nearby SAR chapters or the DAR chapter in our area ~ the Cooch's Bridge Chapter. Secretary ~ Joseph R. Lake Jr.
2016 - 2018 ~ Joseph R. Lake, Jr. Birth to Age 20: Robert Kirkwood was born in Newark DE in 1756. He had eight sisters and no brothers. He attended the Newark Academy (fore-runner to the University of Delaware) and worked the family farm on Polly Drummond Hill. The First Two Years of War (1776-1778): On January 17, 1776, six months before the Declaration of Independence, Robert Kirkwood (at age twenty) was commissioned a First Lieutenant in Col. John Haslet's Regiment of Light Infantry (fore-runner of the Delaware Continental Regiment). Kirkwood fought in many battles of the Revolutionary War, cording his observations in a Journal and in an Order Book that survived the war and have been published. In August of 1776 Haslet's Regiment fought in the battle of Long Island -- the first major battle after the Declaration of Independence. Since the terms of enlistment in the American regiments were for only a few months at this early stage of the war, few of the original men remained in the regiment at the end of the year. Kirkwood was promoted to Captain in December of 1776 and went home to recruit in Delaware, so he was not present at the battles of Trenton (Dec '76) and Princeton (Jan '76). Col. Haslet was killed during the battle at Princeton on Jan 1, 1777. In April of 1777 Haslet's Light Infantry was reformed as the Delaware (Continental) Regiment. David Hall was promoted from senior Captain to Colonel, and Joseph Vaughan was promoted from senior Captain to Major. 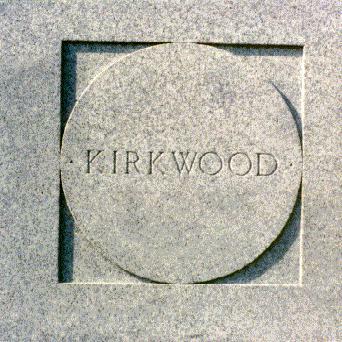 Kirkwood was with the Regiment for the battles of Brandywine (Sept '77) and Germantown (Oct '77). During the latter Col. Hall was so badly wounded that he never again fought. Major Joseph Vaughan was now promoted to lead the regiment as a Lt. Col. In June of 1778 the British abandoned Philadelphia (nine months after taking the city). The Last Five Years of War (1779-1783): In Feb 1779 (after a furlough) Kirkwood and the Delaware Regiment travelled to South Carolina, where Kirkwood survived and escaped capture in the disastrous first battle of Camden SC on Aug 16, 1780. During this engagement some 20% of the 250 men in the Delaware Regiment were killed and 30% (including Lt. Col. Vaughan) were captured. The remnants of the Delaware Regiment were then brigaded with the Maryland Regiment for the remainder of the war, with Captain Kirkwood as the Delaware contingent's senior officer. and the rest were as ragged as wolves." But the Americans won the race with the British forces to cross the Dan River in VA, so the Americans could gather strength and inflict serious damage on the British at Guilford Courthouse NC, Hobkirk Hill SC, the siege of Ninety-Six SC, and Eutaw Springs SC. Jan 16 - March'd to the Cowpens - 12 miles. Jan 17 - Defeated Tarleton. The Eight Years after the War (1784-1791): At the close of the war (Sept 30, 1783) Kirkwood was brevetted to the rank of Major and returned to Newark DE. In recognition of his service during the Revolution Delaware gave Robert Kirkwood 100 pounds (Delaware was then using British units for currency). He married Sarah England. They had a son Joseph R. in 1784 and a daughter Mary. They moved to Odessa and then to St. Georges Station (now called Kirkwood), where Sarah died in 1787. The Northwest Territory had been ceded by the British to the Americans as part of the settlement of the Revolutionary War, but the British encouraged the Indians who inhabited the area to fight the new settlers. The Indians were a confederation of the Shawnee, Delaware, Ottowa, Iriquois, Chippewa, Miami, and Pottawotami tribes. Several major battles ensued. In March of 1791 an expedition under the command of the Governor of the Northwest Territory, Arthur St. Clair, set out to build a line of forts. Robert Kirkwood was commissioned a captain in the Second Regiment of U.S. Infantry (one company of which was raised in Delaware). On Nov 4, 1791, at Fort Recovery [60 miles NW of Dayton OH, on the Indiana border] 1,000 Indians attacked the 1,000 soldiers (plus about 200 support people) and killed some 700 of them (including Robert Kirkwood). This was Kirkwood's 33rd battle. his head smoking like a chimney. Note that "old" Kirkwood was only 35 years of age. Kirkwood's Children and Grandchildren: Joseph Kirkwood, Sarah and Robert Kirkwood's only son, was brought up in Delaware and married Margaret Emily Gillespie there. He moved to Belmont Ohio in 1806, There they had eight daughters and a son there. The son died as an infant. Joseph and Margaret Kirkwood died and were buried in Bridgeport OH. Mary Kirkwood, Sarah and Robert Kirkwood's only daughter, married first ... Boyer and second Arthur Whiteley (also his second marriage) of Dorchester Co. MD. The Whiteley's had only one child, Robert Henry Kirkwood Whiteley, who served as an officer in the Quartermaster Corps of the U.S. Army during the Civil War and was promoted to Brigadier General in 1865. In 1896 he died in Baltimore MD and was buried with his parents in the cemetery of the Head of Christiana Presbyterian Church. 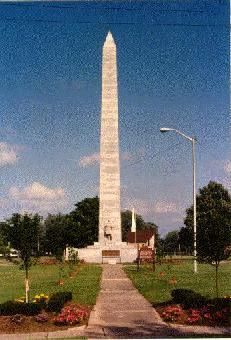 Memorials for Kirkwood A monument now marks the battle area in Ohio. The area that Robert Kirkwood settled in Belmont County is named Kirkwood Township. The town of Kirkwood OH in Shelby County (5 miles south of Sidney off Rt 75) may be named after a different Kirkwood family that settled there. Delaware has recognized Robert Kirkwood's life and death in service to his nation by naming a town and a highway after him. Kirkwood DE is located 8 miles SE of Newark DE, and the Robert Kirkwood Highway (Route 2) connects Newark to Wilmington and passes close by Polly Drummond Hill, where he was born. "The First Combat Infantryman", by Col. Stedman Chandler, pp 29-34 in the June, 1961, issue of Army (published by the Association of the U. S. Army). Revolutionary Patriots of Delaware (1775-1783) by Henry C. Peden, Jr. (Family Line Publications, Westminster Hall MD, 1996).